Smartphones, tablets and other mobile devices are becoming ubiquitous in doctors’ offices and hospitals as a means to standardize care protocols, improve the flow of information, and ease the implementation of electronic health records (EHRs). In fact, mobile devices are becoming as essential as the exam table, according to a survey conducted on behalf of Wolters Kluwer Health by Paris-based market and technology firm. Nearly 80 percent of the 300 practicing primary care, family and internal medicine physicians surveyed said they were using a smartphone in their day-to-day practice. Another 61% were using tablets. According to the study, more than half (55%) of physicians who use mobile devices use both smartphones and tablets in their daily practice. 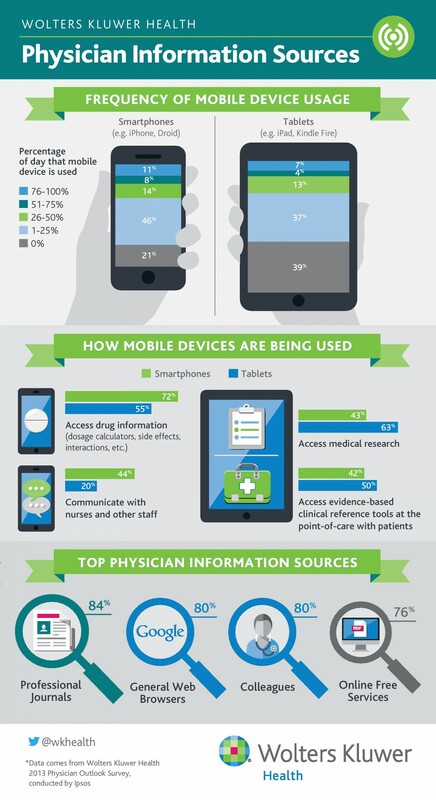 The top use of smartphones is accessing drug information while tablets are used most to access medical research. In addition, mobile apps are being used by 24 percent of physicians, making these the top digital/social media channels used for work purposes. Further, a separate study found that while the majority of charting and EHR interaction is performed via laptop or desktop, nearly half of all clinicians who own a tablet commonly utilize it for EHR management and other clinical documentation. As a result of this shift in mobile health use, more mobile health apps are being developed to cater to the needs of healthcare professionals. This rapid development opens up a large market of mobile device users in all areas of medicine which healthcare organizations are realizing. Everything from care collaboration platforms to mobile EHRs or EMRs is being developed, which is attracting more and more healthcare providers across the globe. In addition, the global mobile health market is expected to grow annually at a rate of 33.5% between 2015 and 2020, according to an Allied Market Research report. This growth could be the result towards pushing EHR implementation to streamline processes and communication within health organizations, or simply making health data more easily accessible. It’s clear to see that mobile health technologies are increasing in popularity globally, and as a result, transforming the face of healthcare. So if you’re a healthcare provider or organization that has yet to go mobile, you may want to consider these statistics and numbers, and make a change. With the digital surge of mobile device use in healthcare organizations the need for doctors and nurses having to recharge their devices is increasing every day. That’s where KwikBoost comes in… our products allow doctors, nurses, and visitors in waiting rooms the ability to recharge their devices while at the hospital or doctor’s office without needing to have their charger or find an accessible outlet. KwikBoost mobile device charging stations can be found charging up healthcare organizations devices in over 1,200 locations nationwide. Our charging stations make it easy for healthcare providers to charge their phones and tablets and can be wall mounted or freestanding. Our charging lockers are designed to securely store phones, tablets, laptops or any other electronic device while charging them. Power Tables and Wall Workstations offer quick and collaborative workspaces. KwikBoost charging solutions keep healthcare professionals charged up without the worry of their mobile device battery running low. Have you or your organization adopted mobile health devices? And have you thought about supporting this trend by using Mobile Device Charging Stations for your organization? See other ways you can keep patients’ devices charged in your facility.